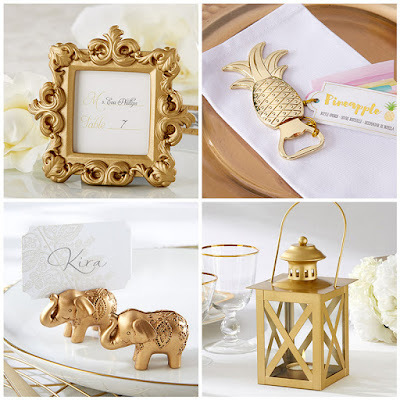 Today we introduce popular gold party favors to you. HotRef has plenty of gold party favors from candle holders to bottle openers, wine stoppers to place card holders and frames which are perfect for gold weddings, 50th gold anniversaries or 50th birthdays! Whether you're into sparkle or into shine, our gold party favors are sure to capture your guests' attentions! When uncompromising elegance is expected, let your moment live up to those expectations with this "Royal" Gold Baroque Place Card/Photo Holder. This gold baroque place card hold is great to direct your guests setting at gold wedding, bridal shower, especially 50th gold anniversary and 50th birthday. Your friends and family will feel lucky when they see these Lucky Golden Elephant Place Card Holders at your gold wedding, 50th gold anniversary or 50th birthday. Place these lovely gold elephant place card holders with seating arrangements on guest's table, or hand them out to guests as elephant wedding favors. They will be memorable reminder of your special event for years to come. To celebrate tropical or gold theme wedding, 50th gold anniversary, 50th birthday or class reunion with Gold Pineapple Shaped Bottle Opener as your party favors! Each bottle opener features a a shiny gold pineapple, this bright favor is sure to put a smile on guests' faces. Leave a profound impression to the party guests of your gold wedding, 50th gold anniversary or 50th birthday with this Classic Gold Lantern. Each gold lantern is crafted from matte gold metal and adorned with an all-over geometric design. Place these gold favors on guest tables as a reminder of how sweet your love is. Happy planning for a gold wedding, 50th gold anniversary or 50th birthday!